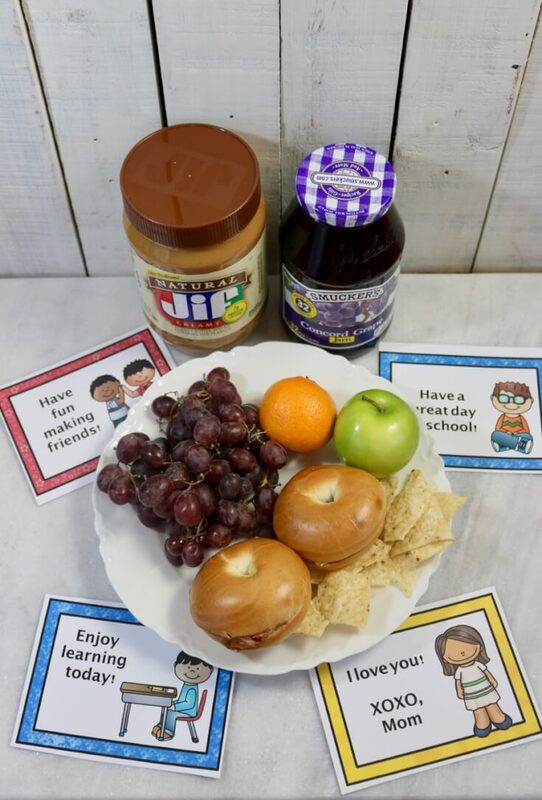 Here I’m sharing an easy recipe for a Peanut Butter and Jelly Bagel Sandwich plus FREE lunchbox notes for kids. 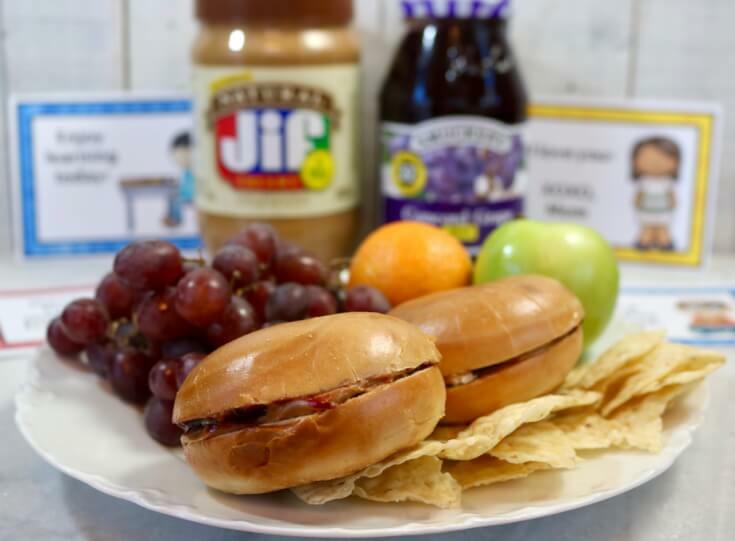 If your child does not like squished sandwiches, this Peanut Butter and Jelly Bagel Sandwich will do the trick. It’s Back to School time again. And, I’m on a mission to stop the squishy sandwich. I learned something interesting while visiting my son’s classroom the other day. To keep lunchtime simple, the teacher has all the kids put their lunch bags in a laundry basket at the back of the room. This means everyone’s stuff is piled, one on top of the other, until the kids are ready to eat at lunch. I always wondered why my son’s sandwich would sometimes come home completely squished. Well, now I know. So, I’ve come up with an easy solution. Bagel sandwiches. 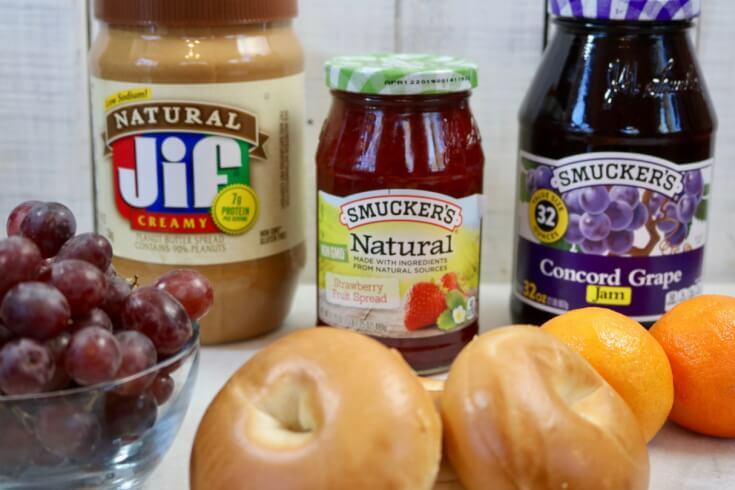 Bagel bread is delicious and it goes perfectly with Jif® Creamy Peanut Butter and Smucker’s® Concord Grape Jam. It’s that old-fashioned taste I grew up with in my Cuban-American home. Now, Jif is one of our family favorites because it goes on creamy and spreads nice and smooth. And Smucker’s is made with real fruit, we all enjoy the taste of real fruit, and Smucker’s has just the right touch of sweetness. Just to show you how easy it easy to create this new adaptation to the traditional Peanut Butter and Jelly Sandwich, I created this short YouTube video tutorial. Follow me on YouTube for more fun kids’ activities and easy recipes. Step 1: Use a knife to cut the mini-bagel into two even slices. Step 2: Spread on the Jif® Creamy Peanut Butter on one half of the bagel. Step 3: Spread on the Smucker’s® Concord Grape Jam onto the other half of the bagel. Step 4: Gently press the two pieces of bagel together joining the peanut butter and jelly. Step 5: Add a lunchbox note for fun. See below to download your FREE Lunchbox Notes for Kids. As a child transitions back to school, a little note of encouragement goes a long way. Take it from a Certified Teacher in Early Childhood Education, this printable pack of 12 FREE Lunchbox Notes for kids is good stuff. Thanks for joining us at HappyandBlessedHome.com. 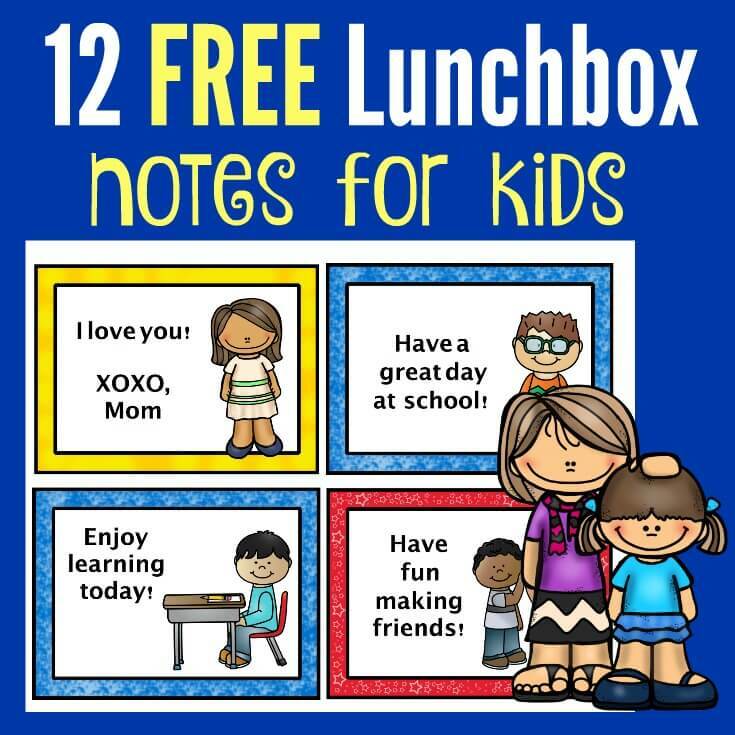 To download your 12 FREE Lunchbox Notes for Kids, just click the yellow “download now” button to get your copy. 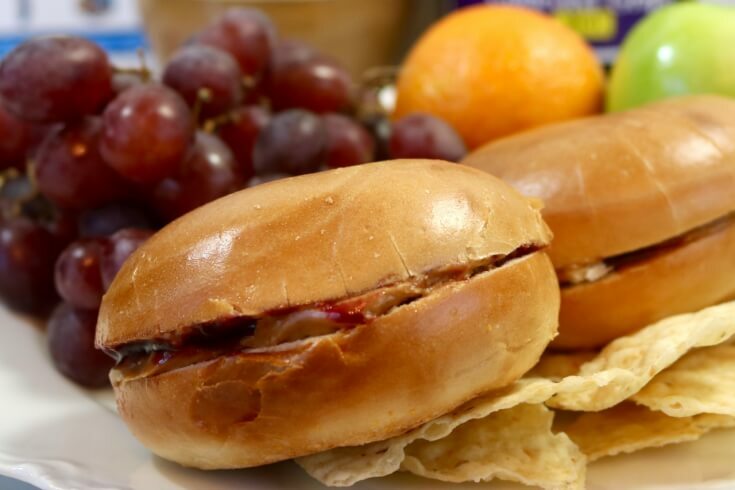 You can find everything you need to create this easy Peanut Butter and Jelly Bagel Sandwich Recipe at Shop Rite. 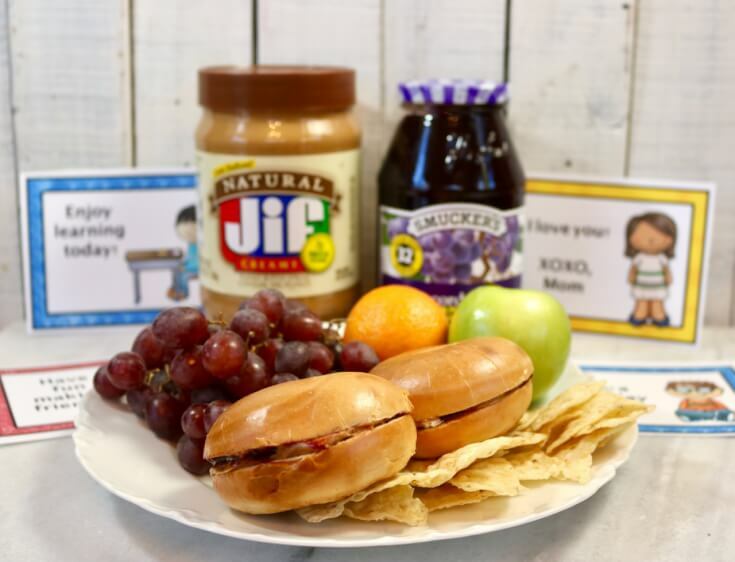 Make sure to save on your next purchase with the Jif Smucker’s back to School Ibotta offer. It will save you $.50 off each individual product, bonus $1 if you buy both. Start Date: 12/31, End Date: 2/3. 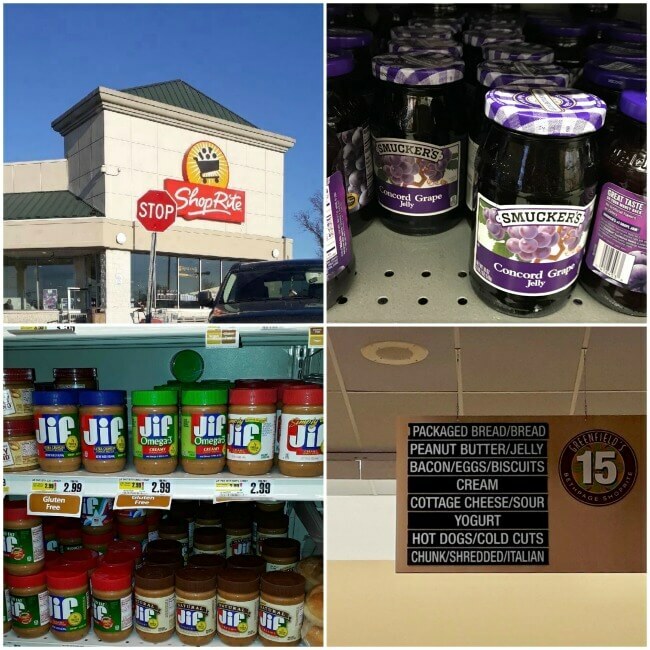 Want to stay in touch with Jif and Smucker’s? Follow them on social media for easy recipes and special offers. What are your favorite ways to enjoy a sandwich? Have you ever tried a peanut butter and jelly bagel sandwich? What types of sandwich creations will you make with this tasty recipe? Do your kids have any favorite sandwich spreads or toppings? I’m always looking for new recipe ideas. Please leave a comment or recipe idea below and join the conversation. I love hearing from my readers. Speaking of cooking with kids in mind, I have some wonderful activities for creating memorable family-fun. These are some of the family fun posts loved by nearly 70,000 fans! Make sure to subscribe so you don’t miss any of my free printables, easy recipes, or games and activities for family fun! Subscribe Here. Thanks for being a fan! Do you have a board for tasty recipes or cooking with kids on Pinterest? Help spread the word and PIN this post on Pinterest!